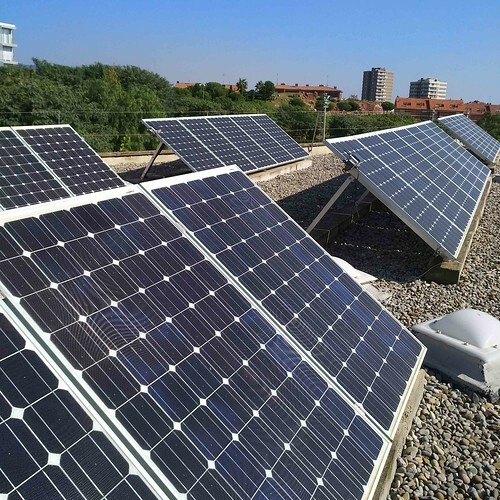 01/30/2019 – The REFER R&D project, led by COMSA Industrial, has installed a disused battery from an electric vehicle in the Tirant lo Blanc library in Montgat, Barcelona, with the aim of storing excess energy and using it at peak times. This is a pilot test that the research consortium is carrying out in order to give a second life to electric car batteries through their implementation in buildings and, at the same time, analyse the energy changes that such equipment may undergo in relation to their consumption. The Tirant lo Blanc library in Montgat, with an area of more than 1500 m2 and an average of 150-170 users per day, has a 150 m2 photovoltaic installation on its roof. The recently supplied battery is 23 kWh and allows the excess energy of the plates to be stored for use at peak times (evenings). Also, the accumulator can be recharged at night, taking advantage of the low energy cost, and discharged during the day when the price is usually higher. The management of the battery is autonomous, being performed through a system in the Cloud that collects information on the operation and consumption of the equipment and, at the same time, is connected to tools for forecasting weather and electricity costs. All this with the aim of facilitating decision-making and improving the energy efficiency of the library. The REFER project, led by COMSA Industrial with the participation of a dozen partners, including specialised companies, research centres and public institutions, is co-funded by the European Regional Development Fund and supported by ACCIÓ, the Catalan Government agency for business competitiveness.